The evolution of partnership forms is stimulated by powerful economic forces that can lead to widespread prosperity and wealth creation for a society. 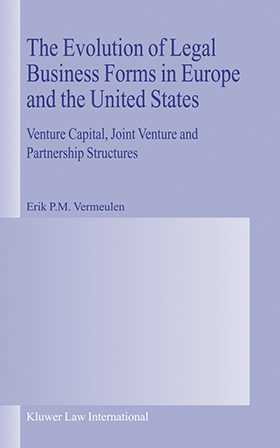 Given the importance of closely held firms in the United States and Europe, The Evolution of Legal Business Forms in Europe and the United States argues that partnership law should trouble itself less with historical and descriptive arguments about the legal rules and structure of the partnership form and focus much more on the new analytical apparatus of the economics of organizational form as well the fundamental economic learning that informs the debates on limited liability, partnership rules regarding management and control, conflict resolution and fiduciary duties. Introducing and extending the best available theories from law and economics, particularly those from the theory of the firm, This book¿s analysis demonstrates that the patterns of European partnership law and its recent history are best understood from an economic and comparative law perspective. By examining the economic theories of the firm and the economics of organization choice, The Evolution of Legal Business Forms in Europe and the United States conceives partnership-type business forms as contractual entities. The key feature of the modern partnership form is that partners have significant flexibility and power to limit their liability, transfer all of their rights, and to freely exit the firm. Another key feature of partnership law is the insight that lawmakers should provide the rules and enforcement mechanisms to regulate the important relationships within the partnership. This book applies an efficiency test to determine which sets of default rules are likely to resolve the main problems in partnerships. Having identified partnership law with the economic theory of organization, The Evolution of Legal Business Forms in Europe and the United States then goes to argue that most of partnership law is directed at offering bundles of legal rules for different types of firms. Lawmakers should promote partnership rules that attract investors and can be expected to be efficient if they allow entrepreneurs to freely select the bundle of rules that best match their priorities. In a modern vision of partnership law, lawmakers promote economic welfare through creating non-mandatory rules that allow multiple businesses to switch to a favourable business form without significant costs. Jurisdictions plagued by falling incorporations and low levels of small and medium business activity, should abandon the mandatory and standardized framework and the `lock in¿ effect that it promotes, and focus on the mechanisms of legal evolution and rules that tend to mimic the market. This innovation work will have ramifications felt across European jurisdictions, and will be debated by a large audience of policymakers and academic lawyers involved in law reform. Moreover, the book will receive serious attention from students of law and economics, as well as practising lawyers involved in resolving complex issues of organizational law.